Last Saturday night, the fifth annual Earth Hour (turn out your lights for one hour) met some blazing competition in the form of BYOB, or Bring Your Own Beamer, a group show of digital video art projected simultaneously and splatter-style on a Pilsen apartment’s walls, ceiling, floor, anywhere. Of the dozen or so projectors, only a couple overheated. The room was packed full of viewers and it was hard to avoid getting a beam of light shot into your eyes every now and then. Sometimes the effect of a projector throwing its image on a body perfectly captured the event’s energy and premise, of being made by and for the crowd. 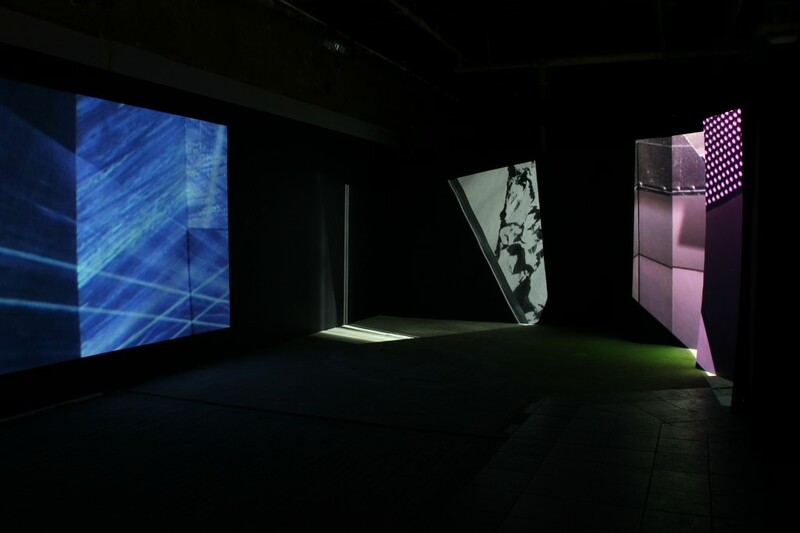 Often, in video art installations, there is some glitchy tweaker noise or looped ambient music to accompany the projections. In the four video art shows I saw this weekend, all of them featured this type of soundtrack, amplifying the lights-off, hyper-sensory experience. Barbara Kasten’s “REMIX” at Applied Arts is accompanied by what used to be called intelligent dance music, by Lucky Dragons; Nicolas Grospierre’s “TATTARRATTAT” video at the Graham Foundation has a minimal soundtrack of softly hypnotic beats; Ben Russell’s sculpture of 16mm projectors at threewalls creates its own hissing and popping music; and a single ambient track blanketed all the videos at BYOB. Sometimes these soundtracks are intrusive, and sometimes they melt into the viewing experience, but they are always necessary; video art today is competing for your attention. Virtually no physical space is required to view video art, but video art installations demand room-sized viewing arenas. There is a lot of air between the projector and the projected image. Sometimes artists play with our expectations of this empty, dark space and turn it into a theater—not a movie theater, but a stage. There is no place to sit, and viewers are made to stand up, move around, not get too comfy but implicated in the art. Barbara Kasten enjoyed watching people camouflage their bodies with her video projections, and the body shadows thrown onto the walls. But if you attend a video installation on a day other than its opening party, you’ll likely be alone, in a dark room, where solitude becomes a technology for self-appraisal. What do you do when you’re alone? Nicolas Grospierre’s video at the Graham Foundation also makes use of a mirror game. A camera bounces around a mansion from room to room off of well-placed mirrors, giving viewers a virtual house tour. 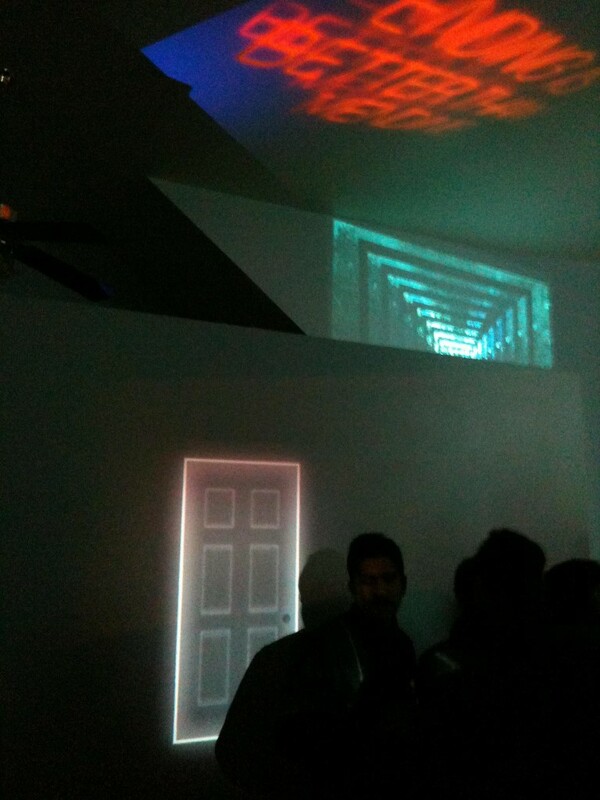 For video installation artists, real space is an additional material, and it is treated like any other virtual thing. Grospierre’s video is site-specific formalism, but unencumbered by the politics of site-specificity. The artist gives us a Google-style digital maneuver to play with perceptual effects. Likewise, it was important for Barbara Kasten’s three-channel video installation to take place in a blackened, raw space, adding to the moody and provisional nature of her videos. The installation is dependent on its venue, and transforms it. Be here now, by being elsewhere.